The Garo Highlands spread at the foot of Mt. Kariba, which is said to be the highest mountain in southern Hokkaido. 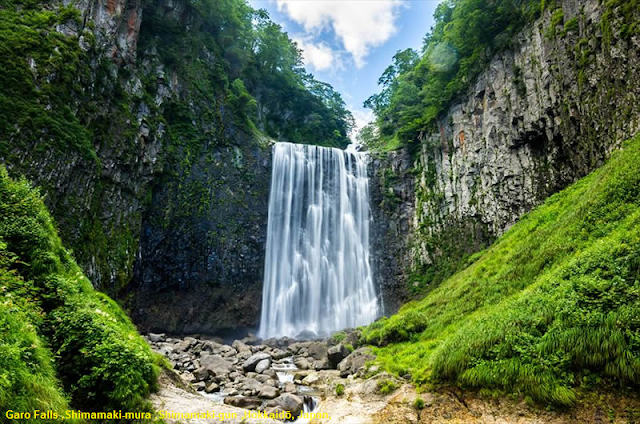 Measuring 70 m in height and 35 m in width, Garo Falls is Hokkaido's largest waterfall. It cascades into the Chihase River, which flows through the highlands. In 1990, it was selected as one of the "100 Best Waterfalls in Japan." "Dragon water," a natural carbonated water, spring out in the vicinity. There is no waterfall like this 70m-tall and 35m-wide waterfall in the whole of Japan, and a legend remains to this day that a dragon guarded the Matsumae clan’s treasure here. A world of mystery that changes with the seasons spreads out before your eyes, and if you go in the morning you can see a rainbow. You can also find the Garo Highland Camping Ground nearby.